All are welcome. Contact Jan Thomas 01453 821 771 for details. This entry was posted in Uncategorized on 15 January 2018 by admin. “The Friend” has recently published two articles by Gloucestershire Quakers. Helen Peters of Painswick Meeting has written about Money, while Noel Baker of Cheltenham Meeting has revealed his love of Strictly Come Dancing! This entry was posted in News on 15 January 2018 by admin. This entry was posted in Area Meeting Newsletters on 14 October 2017 by admin. 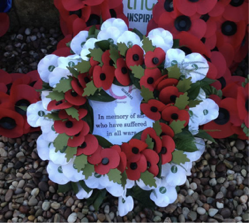 At our Area Meeting in June, we heard about the experiences of Friends in Cheltenham and Forest of Dean meetings of promoting white poppies as a commitment to peace building on Remembrance Sunday in November. But what are poppies, red and white, all about? Friends in Nailsworth Meeting have recently written this short article about the history or red and white poppies, and explaining why they are both relevant today. This entry was posted in News on 6 September 2017 by admin. Quakers have kept records faithfully since the very beginning of the Society in the 17th century. Written records give us a glimpse of the life of a meeting in earlier generations and we in Gloucestershire do our best to preserve these in good order. In July 2017 Nailsworth Meeting produced a compilation from one section of their past minute books. We attach a copy here for the use and enjoyment of others beyond our Area Meeting. This entry was posted in News on 28 July 2017 by admin. A community carbon reduction workshop in action. Photo by Alison Crane. 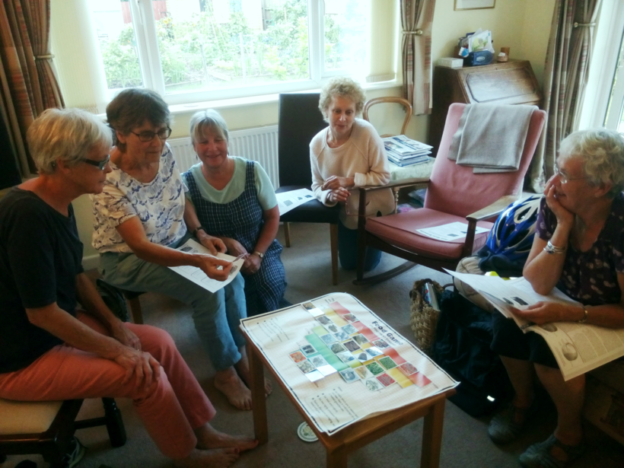 Last year, Gloucestershire Area Meeting was awarded funding by QPSW to run carbon footprinting sessions. We will be running another facilitator training weekend on 30 September – 1 October, in Gloucester. Because places are limited and we want to take the maximum value from the training, we ask that participants are actively recruiting a group in their local area, and have a start date for sessions. There should be two people from each group at the training, who will then co-facilitate their group together. Further information, and ideas about recruiting, from Alison Crane, alisoncrane57@nullgmail.com. The cover of the "Well being" booklet. On 6th May 2017, four young people with supporting adults met at Painswick Meeting House to think about Mental health, a topic chosen at our last Link Group Meeting. Co-operative juggling in the garden confirmed the way we would work together during the day. Walking across the valley to the Quaker Burial ground we ‘Time travelled’ in story, to the site of the original Quaker Meeting House. We made collages of Our Feelings, which we shared in Epilogue with our families. 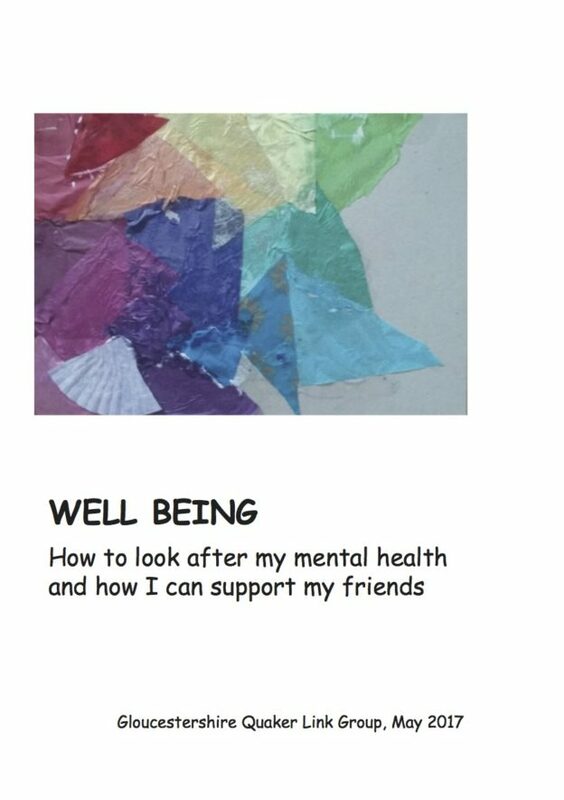 A copy of the booklet “Well-being – how to look after my mental health and how I can support my friends” have been sent to all young people in Area Meeting and to each local meeting. Mary Penny (01453 860262) has further copies if you need them. This entry was posted in News on 14 June 2017 by admin.